Posted September 16, 2016 by The Rapid & filed under Places to Go. Are you ready to check out the world’s most attended art event? ArtPrize 2016 is almost here! Running from Sept. 21 through Oct. 9, ArtPrize Eight will once again transform downtown Grand Rapids into an art museum, performance venue and a chance for public input about art. Founded in 2009 by Rick DeVos as an experiment, ArtPrize has continued to grow and evolve since the start. This art event draws artists and visitors from around the world to Grand Rapids while allowing the community to devour art and cast their votes. This year, there are 1,453 entries, 170 venues, and awards totaling $500,000. For those ready to dig into art early, ArtPrize Preview Week kicked off on Sept. 14 and will run until Sept. 20. This event is new in 2016 and offers a first look at what’s to come when voting begins on Sept. 21. 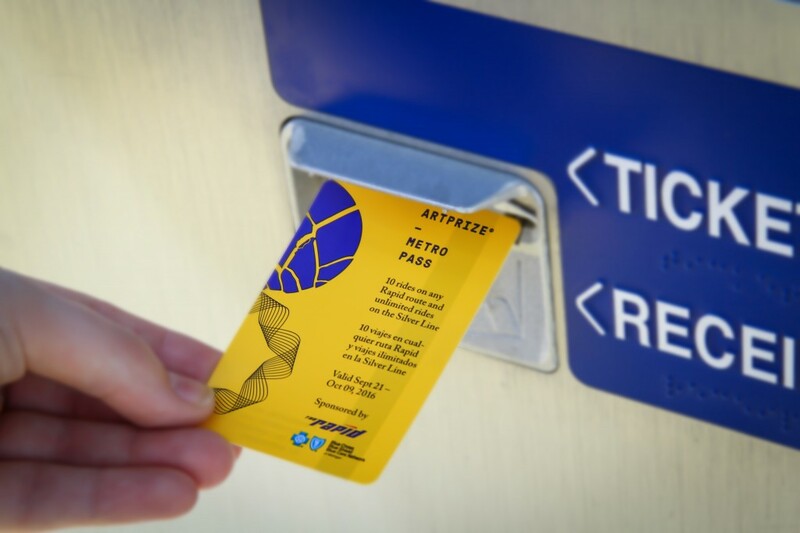 Make your ArtPrize Eight experience even more convenient and wallet-friendly by purchasing your ArtPrize Metro Pass to ride The Rapid to, from and around Grand Rapids. Purchase an ArtPrize Metro Pass for just $5 beginning this Sunday, Sept. 18 at seven Meijer locations. Spending just five bucks (one time) will get you unlimited rides on the Silver Line, and 10 rides on The Rapid’s fixed routes. This amazing deal will provide transportation for the entire 19-day event. Not only can you purchase your ArtPrize Metro Pass from these locations, you can also catch a bus there to head straight to ArtPrize!